Mayweather Promotions in association with Interbox Promotions televised two world championship fights in the super middleweight division on Showtime live from the DC Armory in Washington D.C. The undercard featured some high level prospects such as Chris Pearson in the middleweight division and Sharif Bogere in the super lightweight division, and both were successful in their undercard bouts. The winners of the two televised bouts will likely face each other in a super middleweight unification bout in the near future. Surprisingly, there was a lot of empty seats in the DC Armory despite the fact two legitimate world titles were on the line. The first televised fight was between James DeGale (22-1) and Rogelio Medina (36-6) for the IBF Super Middleweight Championship. DeGale, a former Olympic gold medalist, showed his boxing technique was superior in the first round by sticking and moving well and connecting with quick combinations while easily staying out of the range of Medina. DeGale’s defense was also on point early on as his head movement made him a difficult target for Medina. The second round was close, but DeGale’s punches were slipping in between the high guard of Medina and he was landing more combinations than Medina. Medina, to his credit, continued to press forward and was able to land some punches on DeGale when his back was against the ropes in the third round, but the combinations of DeGale appeared to hurt Medina. DeGale looked extremely confident in the fourth round and was able to land punches from awkward angles, including lead uppercuts and over the top left hands. Medina started off strong in the fifth round and was able to dig in some hard body shots when DeGale was trapped near the ropes, but DeGale ended the round strong with some heavy lead right uppercuts to the chin of Medina. Medina had a strong sixth round and tagged DeGale with more head shots than previous rounds, but DeGale had the best combination of the round. Medina’s pressure continued in the seventh round and DeGale’s jabs weren’t acting as much of a deterrent. DeGale however, still had the higher connect percentage. The eighth round was a close round and Medina’s pressure may have won him the round as he had DeGale stuck by the ropes taking some punishment. DeGale was able to end the round with a hard flurry. DeGale dominated the ninth round and played it safe in the tenth round as Medina was never able to mount an effective offensive combination or hurt his opponent. DeGale simply needed to stay on his feet In the championship rounds to win the fight, and he did so despite the fact Medina never stopped coming forward and tried his best to go for the knockout. James DeGale was able to retain his title with a decision victory with scores of 115-113, 117-111, and 117-111. The main event of the night was between Badou Jack (20-1-1) and Lucian Bute (32-3) for the WBC Super Middleweight Championship. Even though the DC Armory had a large number of empty seats there was a large contingent of vocal Lucian Bute fans in attendance. Both boxers spent most of the opening round trying to feel each other out, but Bute was the more active fighter and was pressing the fight. The action didnt’ pick up in the second round with each boxer landing an occasional straight cross, but neither boxer committed to throwing combinations. The crowd was starting to get restless at the start of the third round, and Jack was able to quiet them with a straight right to the chin after two crosses to the body. Bute was able to answer with a hard left hook, but he appeared to have a small cut near his eye from the earlier exchange with Jack. Bute ended strong with a crowd pleasing straight left. Jack focused his attacks to the body of Bute in the fourth round, but Bute was able to land several clean straight left hands that pleased his fans in attendance. However, Jack dominated the fifth round as his connect rate increased and he momentarily stunned Bute with a hard overhand right. Jack’s momentum continued in the sixth round as he was able to land some hard body shots. Bute was able to connect with a few combinations, but they lacked the power and pop of Badou Jack. The seventh round featured several good exchanges from both men, but Jack appeared to land the cleaner and harder punches. Jack looked like he was wearing Bute down in the eighth round, but Bute was able to pick up his activity in the ninth round and may have stolen it on the judges’ scorecards. Bute scored with some of his best punches of the night in the tenth round, including a few head snapping uppercuts. Bute appeared to have hurt Jack in the eleventh round with a good combination in the middle of the ring and Jack looked like he was starting to fade. Bute went for the knockout in the final round to win the fight and he kept up the pressure on a visibly tired and worn down Jack, but he lacked the power to send Jack to the mat. It was a close bout that many felt Jack felt had won, but the judges scored the bout 117-111 Jack, 114-114, and 114-114 for a majority draw. Moshea Aleem (4-0-1) fought Martez Jackson (2-0-2) to a draw in the junior middleweight division with scores of 38-38 on all three cards. Keegan Grove (1-0) defeated Antoney Napunyi (10-16) by decision in the lightweight division with scores of 40-36 on all three scorecards. Latondria Jones (3-0) wins by TKO at 0:18 in the first round over Kamika Slade (0-1) in the junior middleweight division. Carlos Gongora (7-0) defeated Zacharia Kelley (5-13) by TKO at 1:50 of the second round in the light heavyweight division. Sharif Bogere (28-1) defeated Samuel Amoako (17-10) by in the super lightweight division with scores of 100-90 on all three scorecards. Chris Pearson (17-1) defeated Joshua Okine (22-6) in the middleweight division by decision with scores of 98-92 on all three scorecards. 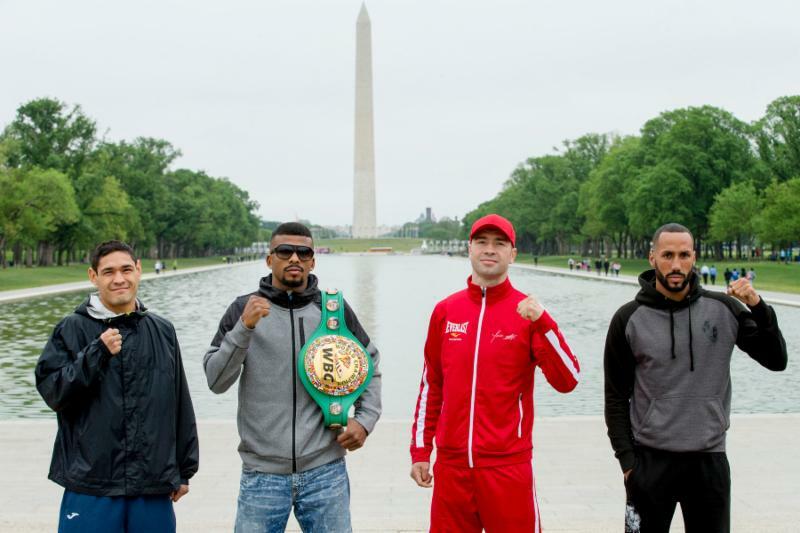 On Saturday night the DC Armory in Washington, D.C. will showcase two super middleweight world title fights live on Showtime. Mayweather Promotions, Interbox Promotions, and Matchroom Boxing have teamed up to create an eliminator style tournament to unify the WBC and IBF Super Middleweight belts. One title fight will be between Badou Jack and Lucian Bute for Jack’s WBC Super Middleweight title and the other title bout will be between James DeGale and Rogelio Medina for DeGale’s IBF Super Middleweight belt. The winners of both of these bouts will likely face each other in the near future. The following is a preview of both the televised bouts on Showtime. Badou Jack is one of the stars of Mayweather Promotions and currently holds the WBC Super Middleweight title. 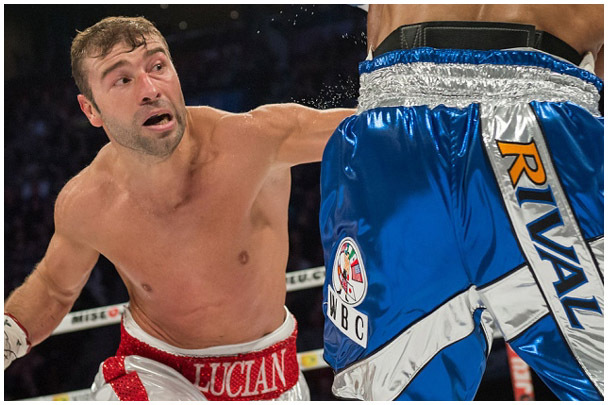 Lucian Bute is a former IBF Super Middleweight Champion and was considered one of the top super middleweights in the world for a significant period of time. When Showtime held their Super Six Tournament that Andre Ward won, many thought Bute should have been included and was overlooked. However, Bute is now thirty six years old and has gone 2-3 in his past five fights. He’s four years older than Jack, and will have a slight half an inch height advantage and will be giving up one inch in reach. Bute, a southpaw, has been relatively inactive the past three years. He fought twice in 2015 and once in 2014, and he did not fight at all in 2013. In comparison Jack has been extremely active. He fought twice in 2015, three times in 2014, and six times in 2013. Both boxers had successful amateur careers. Bute was a Bronze medalist in the 1999 World Championships and Jack competed in the 2008 Summer Olympics for Gambia. Bute’s losses have come against James DeGale, Jean Pascal, and Carl Froch; all good losses against tough opponents. His biggest victories include Denis Grachev, Glen Johnson, Jean Paul Mendy, Edison Miranda, and Librado Andrade. Jack’s lone loss was an upset loss to Derek Edwards in February of 2014. He has bounced back nicely since that loss and has defeated the likes of George Groves and Anthony Dirrell in two close bouts, as well as Rogelio Medina, Marco Antonio Periban, and Farah Ennis. If this bout took place five years ago it would have been a difficult bout to pick. But Bute hasn’t looked good inside the ring since his knockout loss to Carl Froch and Badou Jack’s stock has been rising. This will likely be Bute’s last chance at a legitimate world title, and it’s unlikely he’ll be successful. This bout, by far, is the bigger mismatch of the two world title fights. James DeGale is three years older than his opponent and they have similar measurable such as height and reach, but is a significantly better technical boxer. Medina, however, is the bigger puncher of the two as he has thirty wins by stoppage while DeGale only has fourteen stoppage victories. DeGale, a southpaw, won the Gold Medal in the 2008 Summer Olympics while Medina has no major international amateur accomplishments. Medina has gone 4-1 in his past five fights, but three of his losses were by KO and one of those wins came against an opponent with a record of 0-21. Medina only major win came against J’Leon Love in 2014, which was considered a shocking upset. His losses have been to Jonathan Gonzalez, Badou Jack, Marcos Reyes, Jose Uzcategui, and Gilberto Ramirez. Medina also lost to Yori Boy Campos, who was way past his prime at the time with 113 professional bouts to his credit when he defeated Medina. DeGale’s lone loss was the fellow countrymen George Groves by a close decision. He has since won twelve fights in a row and has defeated the likes of Lucian Bute, Andre Dirrell, Marco Antonio Periban, Brandon Gonzales, Dyah Davis, and Paul Smith. Medina has the power to score a shocking upset victory like he did against Love, but it’s unlikely a boxer with a Gold Medal amateur pedigree will take unnecessary risks to give Medina a shot at an upset. This is a bout DeGale should win easily, and likely set up a future bout with Badou Jack in the near future.